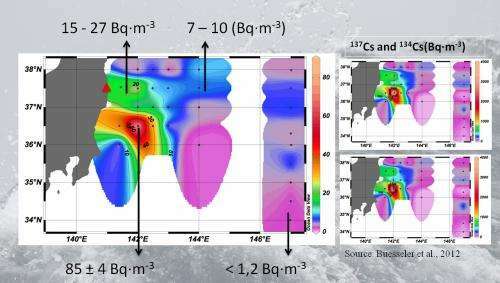 Researchers from the Institute for Environmental Science and Technology (ICTA) and the Department of Physics of the Universitat Autònoma de Barcelona (UAB) have studied the spread of radioactive strontium in the coastal waters of eastern Japan during the three months following the Fukushima nuclear accident, which happened in March, 2011. The samples analysed show the impact of the direct release of radioactive materials into the Pacific Ocean, and indicate that the amount of strontium-90 discharged into the sea during those three months was between 90 and 900 Tbq (terabecquerels), raising levels by up to two orders of magnitude. The highest concentrations were found to the north of the Kuroshio current, which acts as a barrier preventing radioactive material from being carried to lower latitudes. This study measures the concentrations of the main strontium radioisotopes (90Sr and 89Sr) released into the sea over the three months following the accident at the Fukushima Dai-ichi nuclear power plant. The researchers took part in an oceanographic campaign led by Woods Hole Oceanographic Institution, in June, 2011. 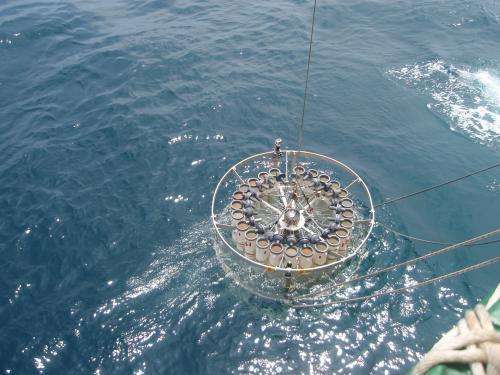 They analysed samples of water from the surface and from up to 200 metres in depth in an area between 30 and 600 kilometres off the eastern coast of Japan. This work was carried out in collaboration with the University of Seville. The concentrations found were up to 85 Bq·m-3 (becquerels per cubic metre) for strontium 90 and 265 Bq·m-3 for strontium 89. These findings point to an increase of up to two orders of magnitude – a hundredfold- in concentrations of strontium-90 in the sea, with respect to the background values for this part of the Pacific before the Fukushima accident, which were 1.2 Bq·m-3. The presence of strontium-89, with a half-life of only 50 days, was further proof of a recent release. The highest concentrations of radioactive strontium were found 130 kilometres from the coast, in the eddies that form at the meeting point between the Kuroshio and Oyashi ocean currents. The levels of strontium-90 were compared with those of caesium 137, collected in the same survey. This allows researchers to estimate that between March and June 2011 the nuclear accident led to a release into the sea of between 90 and 900 Tbq of Sr-90. "Although on a global scale, the Fukushima Dai-ichi accident and the amounts released from March to June, 2011 meant a relatively small increase in this radioisotope in the oceans – less than 1% - the impact on the area studied was very obvious, showing the need to continue monitoring it and assess its possible effects on coastal fauna", explains Núria Casacuberta, an ICTA researcher at the time of the survey and now a researcher at ETH-Zurich. "Since June 2011 there have been further large discharges of strontium from Fukushima that have not been measured with precision. This does not necessarily mean that levels are now higher than two years ago: they could even be lower, as the isotope is diluted and dispersed over time. Whatever the case, however, more research is needed into the impact of radioactivity on the areas that were most affected", explains Pere Masqué, coordinator of the study. Radiostrontium discharges in Japan had not been sufficiently studied until now, mainly due to the difficulty of analysing it in seawater samples. The presence in the marine environment of other radioisotopes like Iodine 131, Cs 137 and 134 (among others), has been tracked relatively exhaustively, but this is not the case with Sr-89 and 90. The only data available up to a few months ago were from measurements taken in the discharge channels of the plant itself, which were published by the Japanese Ministry of Science and Technology and the Tokyo Electric Company (TEPCO). This study, as well as helping to assess the impact of radionuclide releases into the marine environment soon after the Fukushima accident, serves as a starting-point for other studies that are currently under way. Also, the signal from several radioactive isotopes will last for decades and can be used to track the dynamics of currents in the Northern Pacific. Along with caesium-137, Sr-90 is one of the most important artificial radioactive isotopes released into the environment, with a half-life of 30 years. Strontium's chemical behaviour is similar to that of calcium, and it can accumulate in organisms, especially in bone. Before the Fukushima Dai-ichi accident, Sr-90 was present in the oceans in concentrations of approximately 1 to 1.5 Bq·m-3. The main sources of this radionuclide in the marine environment are fallout from the atmospheric nuclear tests performed in the 50s and 60s, calculated at around 116 PBq, and the discharges from the Sellafield (UK) and La Hague (Fr) nuclear reprocessing plants (approximately 4000 Tbq), contributing principally to the presence of this radioisotope from the Atlantic to the Arctic.